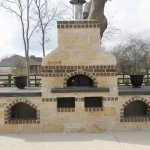 Texas Oven Co. Chicago style pizza, wood-fired - Texas Oven Co. 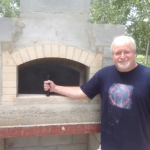 When I think about a wood-fired pizza, I don’t think about Chicago style pizza. I see a thin crust with a fleck of char, a spare scattering of ingredients, fresh mozzarella, the oven at 900°, and a pizza done in 60 seconds. 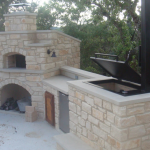 Nothing beats the taste of authentic Italian-style pizza from a wood-burning oven. Once you taste it, you can never go back. 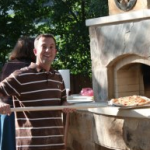 Google “best pizza” in most cities and restaurants with a wood-fired oven are high on the list. 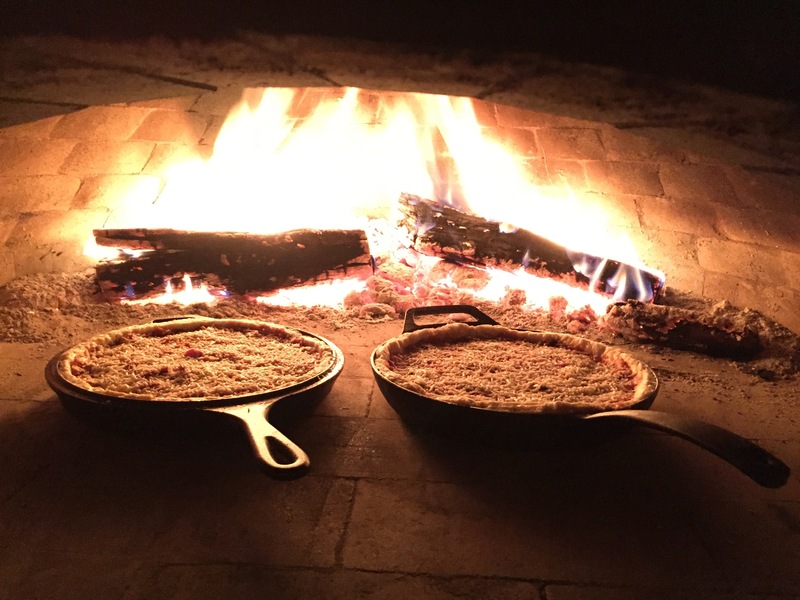 Fiery heat and pizza go together, so why make any other pizza than the thin crust—signature of a wood-fired oven? 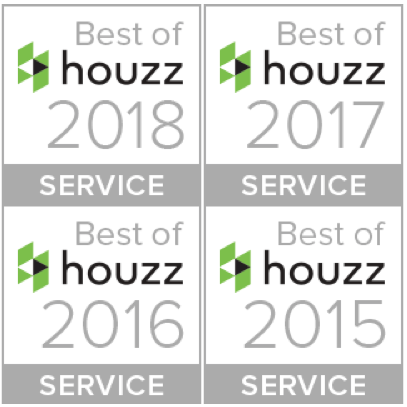 But, we’re always blogging about the versatility of a wood-fired ovens and cooking at various temperatures from blazing down to low and slow. 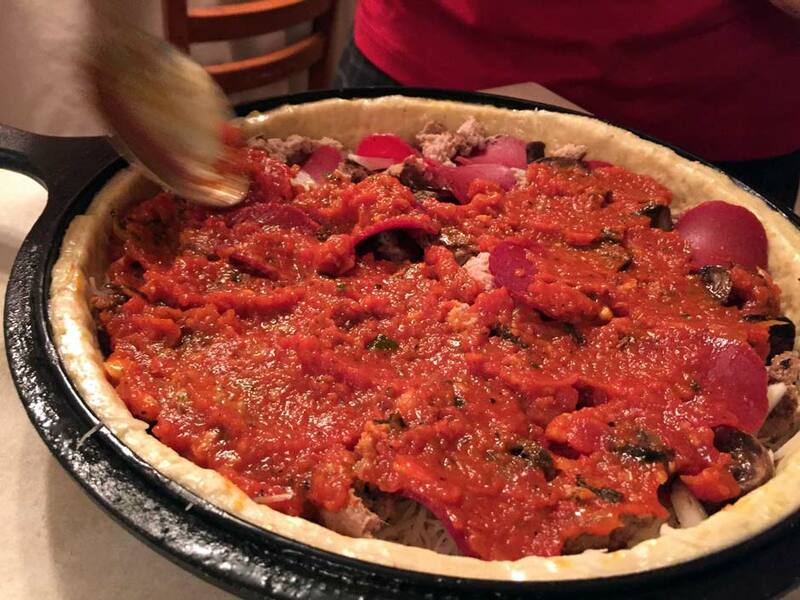 So when a friend asked about making an authentic Chicago-style deep dish pizza in a wood-fired oven, it sounded like an interesting challenge. We decided to try it. Fred searched and found some dedicated fans who have mastered making deep dish. 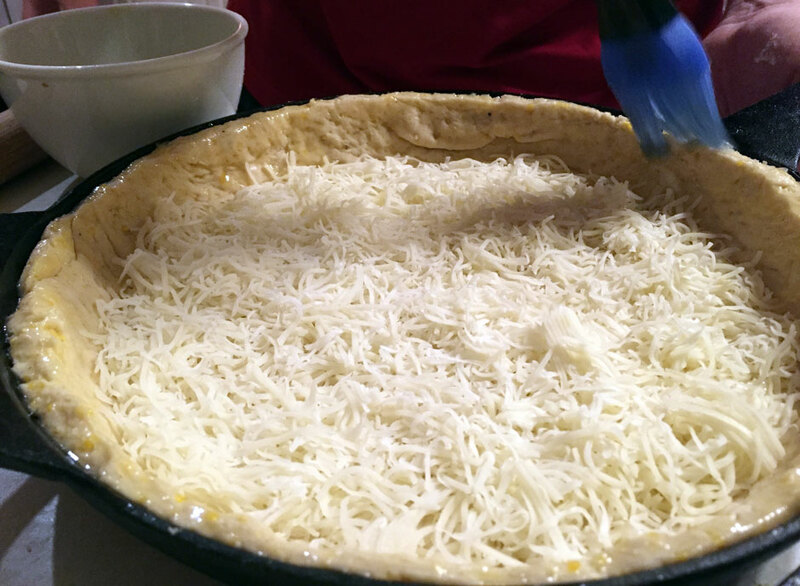 Most people agree on the critical elements of Chicago style pizza: a pastry-like crust (but not greasy) with texture and a trace of sweetness, a thick assertive sauce that also works as a dip, proper layering, and balanced toppings that don’t make a soggy mess. The night before the challenge we made the dough and sauce. 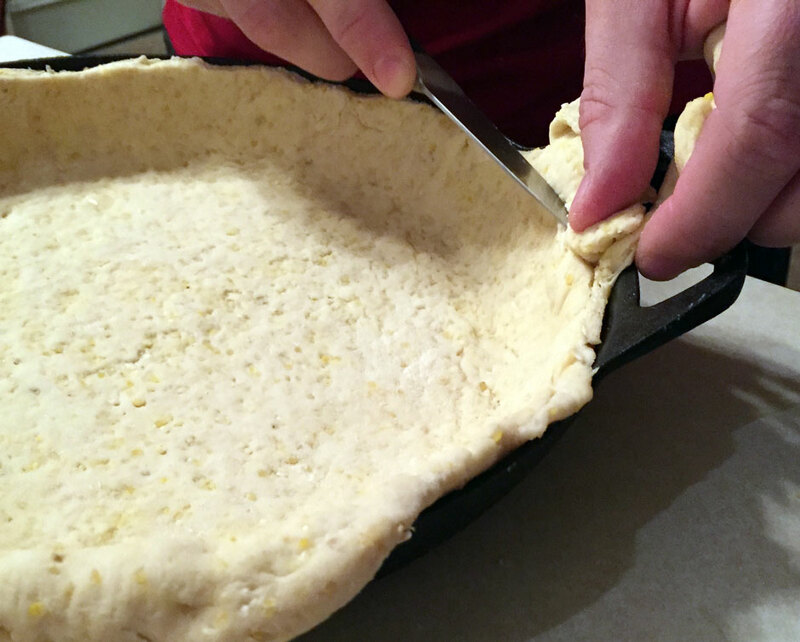 The Sally’s Baking Addiction recipe for authentic Chicago style pizza calls for a quick laminating technique and a bit of cornmeal to create the distinctive textured pastry crust. 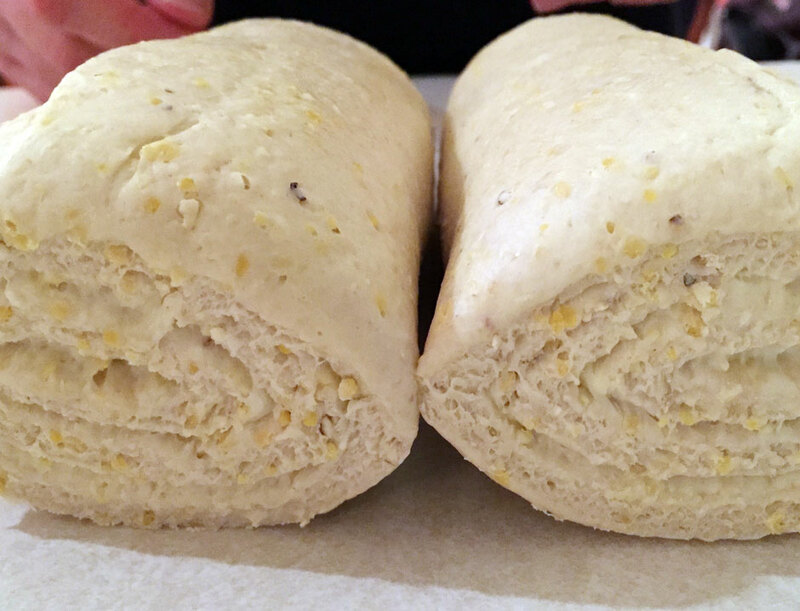 We followed the crust recipe but chilled the dough in the refrigerator overnight, a slow-ferment before laminating. We also tweaked her sauce recipe to make it more assertive. I suggest that anyone trying this challenge make the sauce as recommended, taste it and then add more of the spices to get a flavor you love. We ended up with a sauce good enough to eat by itself. 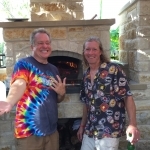 On bake day, Fred and Steve came over at 6:00 pm. They brought the sauce and cheese, and I had the dough ready to laminate. 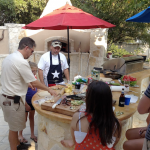 We let the fire roll while we laminated the dough, prepped the ingredients, and assembled the pizzas. 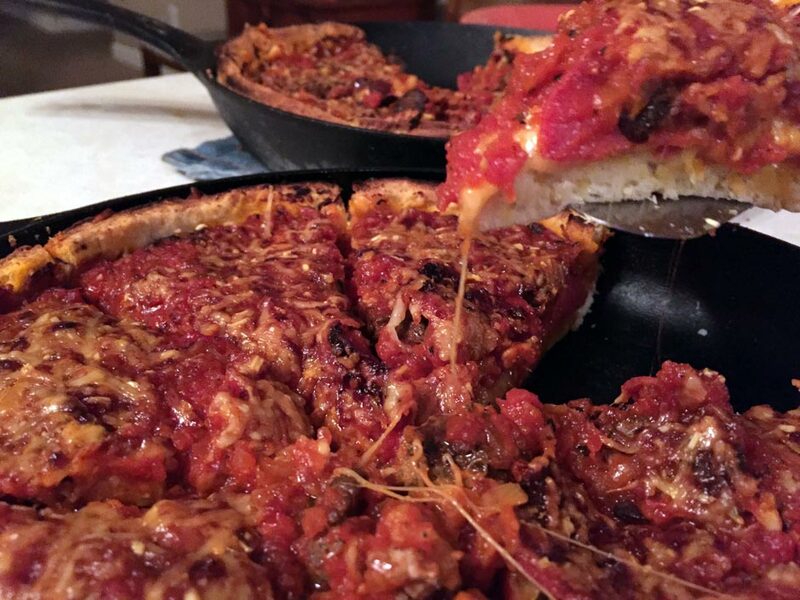 Many traditional Chicago style pizzas are baked in special steel pans that come out of the oven to the table. 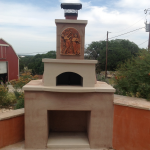 We chose heavy cast iron for the same versatility. 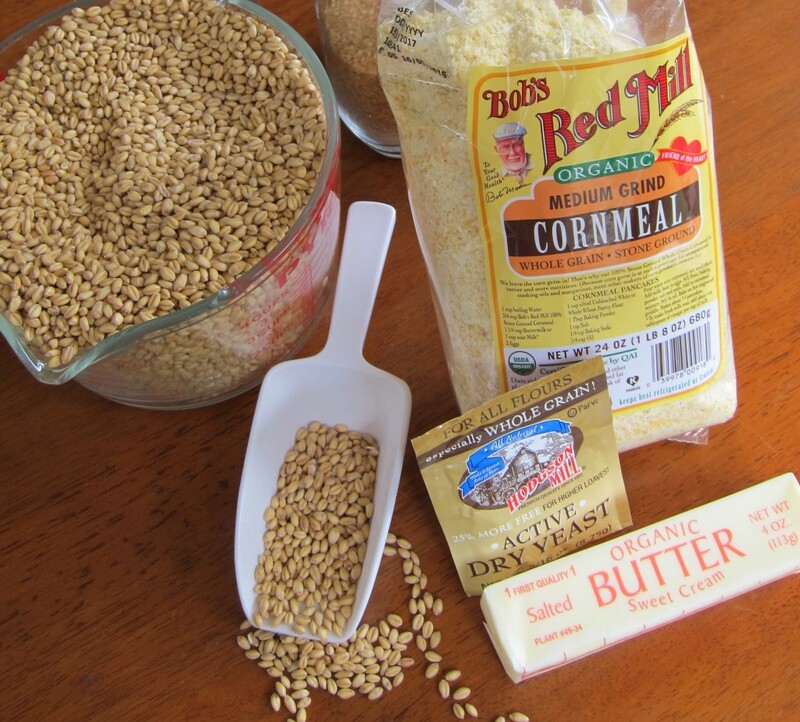 We prepared two cast-iron skillets by greasing them with coconut oil, then put in the crusts. For the toppings, we made sausage from ground turkey and also sliced up some turkey pepperoni—making it a more traditional pizza with meat and cheese only. 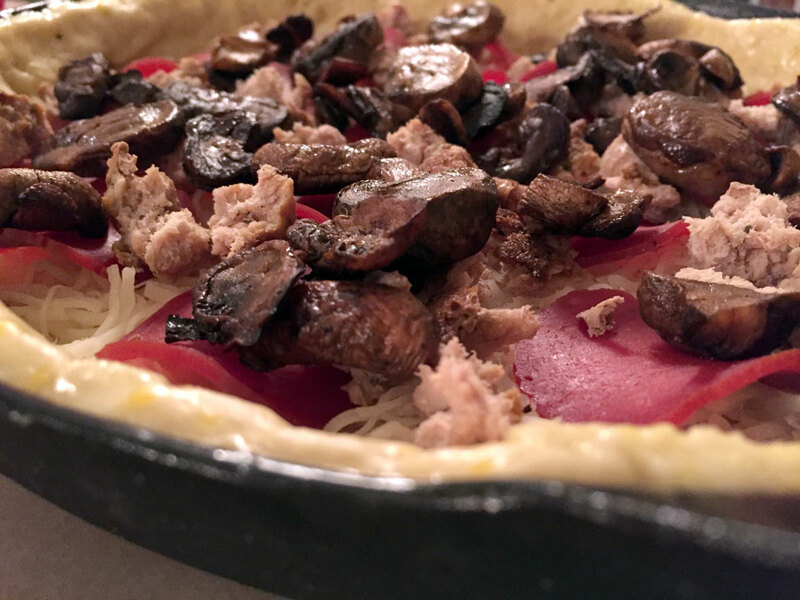 The Chicago style pizza recipe makes enough for two, so on the second we added sautéed mushrooms, red bell peppers and onions (make it a non-traditional Chicago style pizza). We pre-cooked the veggies to remove moisture and avoid making the pizza soggy. 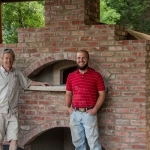 By the time we had assembled the pizzas, the oven floor and vault were radiating steady heat, and the oven hovered around 500°. 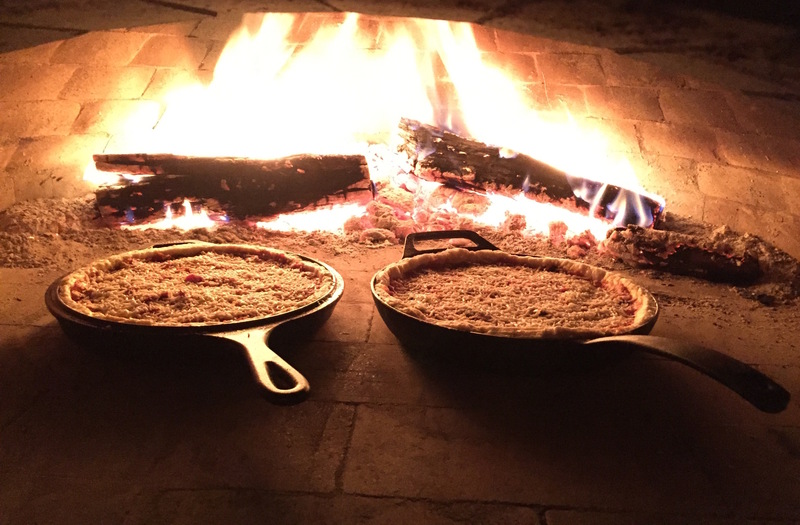 We pushed the fire back in the oven and slid in the pizzas. The Chicago-style pizzas were fantastic. The crusts had just the right texture, golden on the outside and baked through. 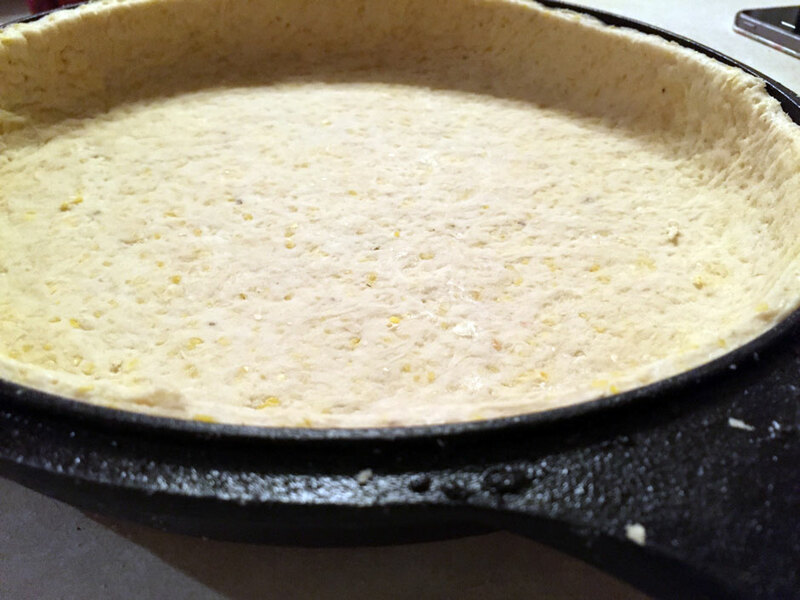 I particularly liked the aroma of the baked butter crust. When we cut the pizzas, the filling held together. The acidity of the sauce counter balanced the rich butter, cheese and meats. 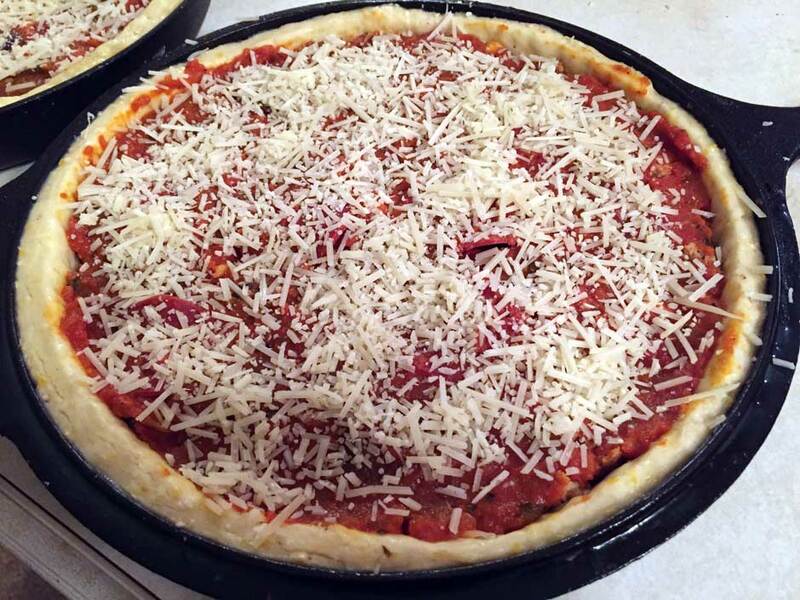 Would I make Chicago style pizza again? Sure, but I just don’t think of it as pizza. It takes more prep, and it takes restraint to keep the temperature in check. However, it was worth it to give a taste of home to my friends from Chicago.